Athena sweep-off depalletisers, proposed by FMT, are designed for depalletising bulk containers of different type and material (glass, plastic, metal).Characterised by a sturdy construction with two uprights, they sweep-off the product at a high level and provide high production capacities. The machine is equipped with programmable and motorized guides that compact the layer that has to be depalletised; the containers are transferred to a chain conveyor with divider without pressure. The machine is equipped with a layer pad pick-up device and with a magazine for separate storage of layer pads, trays and pallets. The operator interface with user-friendly touch screen panel provides also for quick and tool-free changeover; all machine programs are controlled by a standard PLC. Motors are controlled by means of encoders. The series includes also a magnetic head option, for the handling of tin-plate cans. 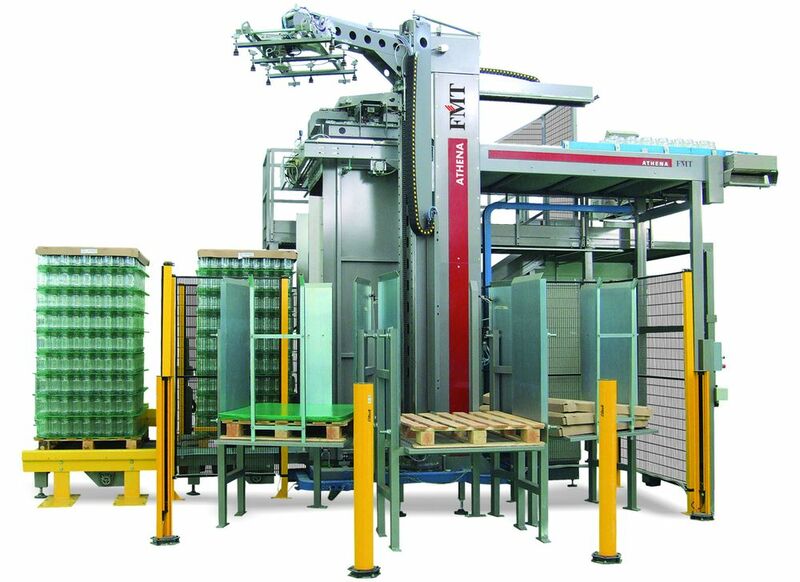 The machine can handle following pallet dimensions: 1120×1420 and 1000×1200 mm, with 2900 mm maximum height.